When a loved one receives an Alzheimer’s diagnosis, the news can be devastating for both the senior and the family members who support him or her. With that in mind, there are a number of resources and outreach programs available for family caregivers of elderly parents with Alzheimer’s disease. Rhode Island Home Care Assistance recommends the following Alzheimer’s support groups for family caregivers. For immediate assistance over the phone, family caregivers can reach out to the Alzheimer’s Association Helpline or the Alzheimer’s Disease Education and Referral Center hotline at any time for outreach and support. Additionally, the Alzheimer’s Foundation of America offers a free monthly teleconference to anyone interested in connecting with other family caregivers and learning more about the disease. 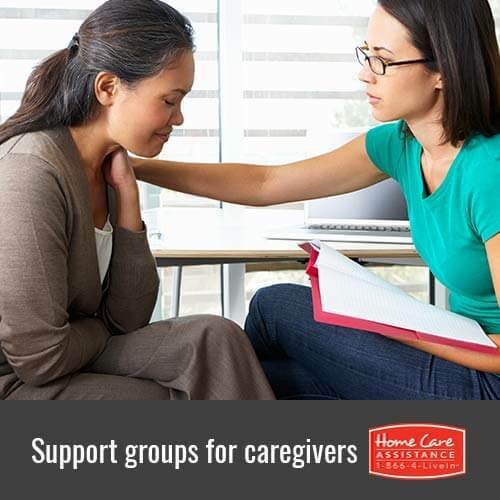 Some family caregivers in Rhode Island may prefer to attend in-person support groups. While these support groups differ by location, there are organizations that can provide more information regarding face-to-face meetings. An Alzheimer’s diagnosis can be difficult for loved ones, but with help from Home Care Assistance, you can give your loved one the care he or she deserves while getting the time you need for yourself. Our expertly trained caregivers use the Cognitive Therapeutics Method, a program that promotes cognitive health and sharpens mental acuity among seniors with Alzheimer’s, dementia, and Parkinson’s, at no additional cost. To learn more about our home care services, call us today at 401.284.0979 and speak with an experienced Care Manager. Why Are Local Chapters of the Alzheimer’s Association Splitting from the National Organization?